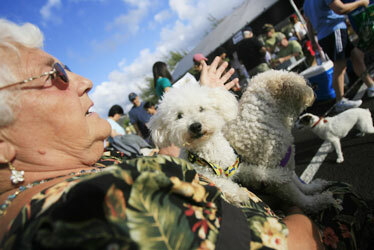 Dogs and humans trotted over Hawaii Kai Marina Bridge Sunday during the annual Hawaii Kai Dog Walk in Hawaii Kai. The walk featured hundreds of dogs and their owners on a 2.5-mile trek through Hawaii Kai that ended with a preview of the soon-to-be-opened Hawaii Kai Bark Park on Keahole Street. Hana Boy the toy poodle, above middle, peered at the camera while seated in the lap of his owner, Sister Anne Moriarty. At right was Lei Lei the poodle. 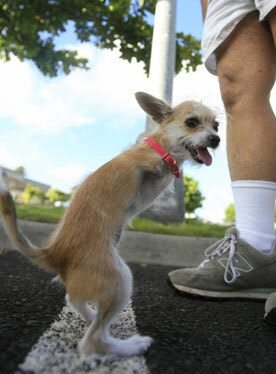 Babe, an 8-month-old Chihuahua-poodle mix born with no front legs, rose to the occasion for owner Warren Hoopii, right.